After John's disciples left, Jesus began talking about him to the crowds. "What kind of man did you go into the wilderness to see? Was he a weak reed, swayed by every breath of wind? Or were you expecting to see a man dressed in expensive clothes? No, people who wear beautiful clothes and live in luxury are found in palaces. Were you looking for a prophet? 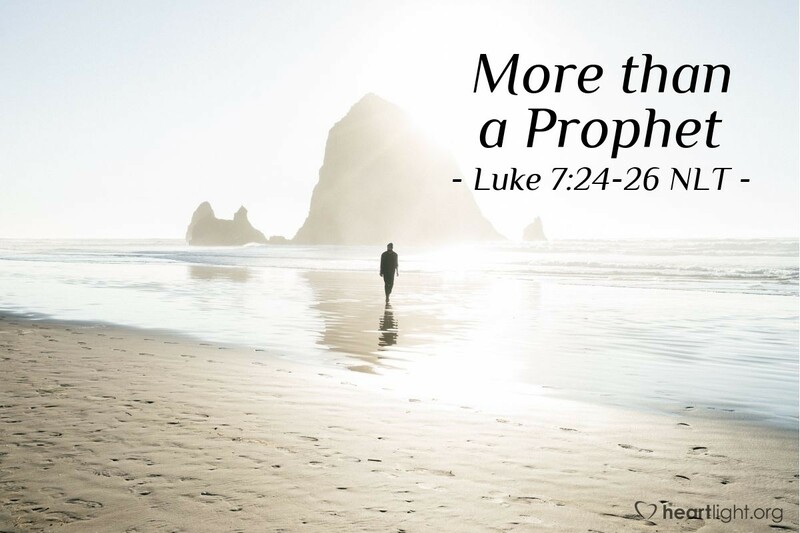 Yes, and he is more than a prophet." John the Baptizer had changed everything! The voice of God in the prophets had been silent for hundreds of years. When John burst onto the scene, the people heard the human voice of John; but underneath that voice, they felt the power and presence of God. John came and was a prophet who pointed others to Jesus. But John was much more than a prophet; he was a trailblazer. He made the way ready for the Messiah and opened the hearts of the people to the Savior who was the Lamb of God. He spoke with integrity and lived with the singular focus of preparing the way for God's Messiah. He was known by his godly character, his passionate preaching of God's message, and his unquenchable passion for making people ready for the Messiah. He was Jesus' cousin, forerunner, and servant. Yes, John was much more than a prophet! O God Almighty, the great God who keeps his promises and is faithful to his people, thank you for sending John. I appreciate his example of service to Jesus. I am convicted by the integrity and clarity of his message regardless of his audience. Help me to be more like John in my service to my King, Jesus, in whose name I pray. Amen.